Experience the Beauty of Laminate. With advances in technology, laminate can now give you the look and feel of granite, wood, and other natural surfaces. Texture is added to the laminate surface, creating a beautiful stone or wood grain pattern that forms the appearance of the real material. Combine these textured laminates with a Hartson-Kennedy edge profile to create an elegant countertop at a value you will enjoy for years to come. 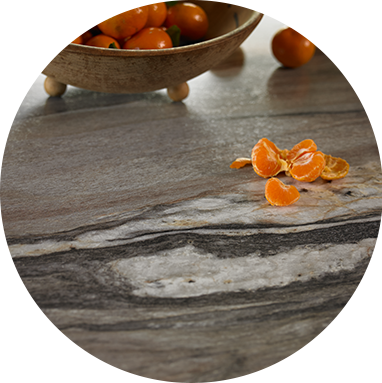 Hartson-Kennedy laminate countertops are manufactured from renewable resources, make good use of recycled and recovered components, and exhibit low air emission characteristics to maintain high quality indoor environments. A truly green option for your home. 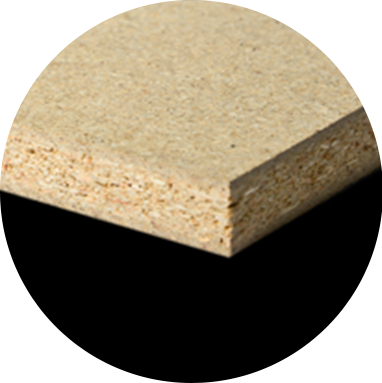 Laminate is non-porous and does not support mold or bacteria growth. Leave a lemon slice on a granite countertop or spill a little vinegar and it will need to be resealed to make it safe against bacteria. Only laminate offers an integral backsplash that seals out air and waterborne pathogens that could otherwise accumulate, making laminate one of the healthiest countertop option on the market. 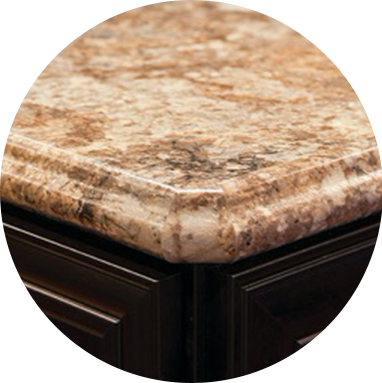 Hartson-Kennedy kitchen and vanity tops feature a ¼” radius cove on the backsplash to make clean-up a snap. Most clean up simply involves a damp cloth with mild soap. Window cleaner will also put a shine on countertops like it does on windows. Abrasive cleaners should be avoided and coasters used to keep your top looking new for years. Click here to see our use and care guides. Laminate is a very versatile product and can be used for various applications, such as countertops, doors, panels, partitions, desktops, cabinet doors and faces, furniture, and shelves. 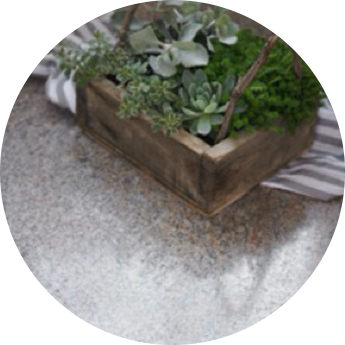 Make it all with laminate. With a look that truly can imitate natural stone and wood, laminate comes at a fraction of the price of those materials. Smart money buys laminate. Hartson-Kennedy stocks a large number of colors and finishes from all the major laminate manufacturers. Because of this, we can offer some of the best lead times in the industry. Literally hundreds of laminate color and pattern combinations are available. Colors range from vibrant pure colors to patterns that simulate the look and feel of natural stone and wood at a fraction of the price. Check out our stock colors here. Add to that the fact that we offer nine different edge treatments and you’ll be amazed with the options. Check out our stock colors here. 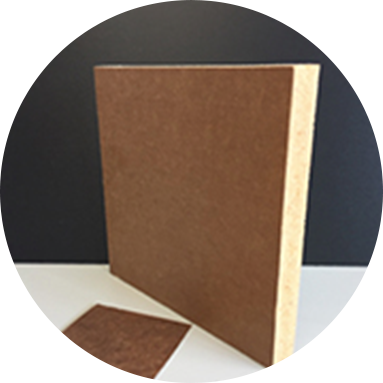 High pressure decorative laminate (HPDL) is made by saturating sheets of decorative and core paper with resins, then pressing them under high heat, fusing the layers into a single sheet. The result is a hard, durable material that’s water resistant, easy to clean, non-porous, and inexpensive. 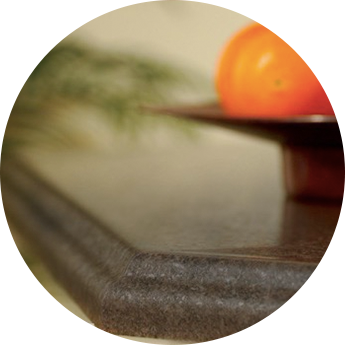 We use only the most durable varieties of laminate for our countertops–horizontal- and postforming-grade. 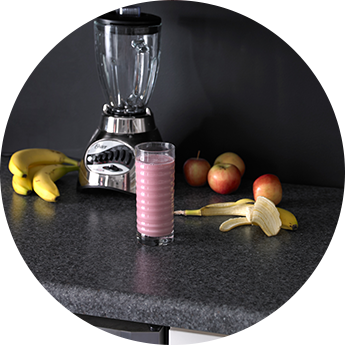 Hartson-Kennedy never uses vertical grade on our tops, ensuring the longest lasting countertops on the market today.